Yulia Skripal, seen in an image taken from her Facebook account earlier this month. The 33-year-old daughter of former Russian spy Sergei Skripal is "improving rapidly," according to hospital officials. More than three weeks after Yulia Skripal was first exposed to a suspected nerve agent, the daughter of a former Russian spy is "improving rapidly and is no longer in a critical condition," U.K. health authorities have announced. The Salisbury NHS Foundation Trust says that "her condition is now stable." Sources tell the BBC that she is "conscious and talking." Her father, Sergei, who was poisoned alongside her, is still in critical but stable condition. Since father and daughter were found slumped on a shopping center bench, the sudden, serious illness afflicting them has taken its place at the heart of an ongoing international dispute. U.K. officials believe Russia is behind the attack, which they say deployed high concentrations of a military-grade chemical weapon known as Novichok. "As a result of detailed forensic and scientific examination, detectives believe the Skripals first came into contact with the nerve agent at their home address," London's Metropolitan Police Department announced in a statement Wednesday. "Specialists have identified the highest concentration of the nerve agent, to-date, as being on the front door of the address." On Thursday, police noted that they had also placed a cordon around a children's play area near the Spripals' home "as a precautionary measure." But they added that "the risk to the public is low." British law enforcement is investigating the poisonings as attempted murders. As, the U.K. and more than 20 other countries announced they're expelling Russian diplomats in retaliation for the suspected attack on the 66-year-old ex-spy and his 33-year-old daughter, Russia has responded in kind. The U.S. ordered the expulsion of 60 Russian officials and ordered a Russian Consulate closed in Seattle on Monday — the same day Germany, Poland, Canada and many others announced similar expulsions of their own. In a move that sharply escalates already-deepening tensions with the West, Russian Foreign Minister Sergey Lavrov said Thursday that Russia will expel 60 U.S. diplomats and close the U.S. Consulate in St. Petersburg. Lavrov also said Russia will respond to other countries that have expelled Russian diplomats in a "reciprocal fashion," according to Russian media. The Kremlin, for its part, has dismissed the murder claims as "as part of a large-scale political provocation," saying the U.K. has failed to adequately provide proof for its allegations. The outlook for the Skripals themselves has proved just as rocky as the international turmoil swirling around their hospital beds. 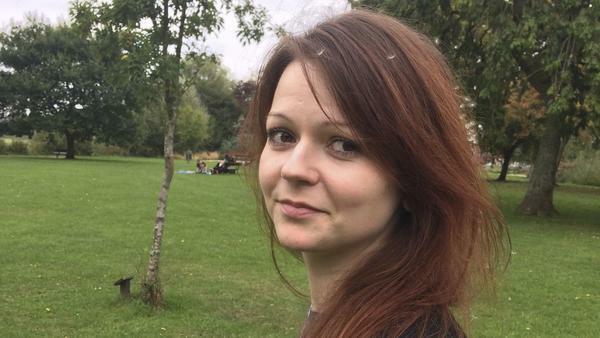 "Everyone is saying that even if they recover, the long-term prognosis is not good," Viktoria Skripal, a niece of Sergei's who remains in Russia, told the BBC. "Out of 99 percent I have maybe 1 percent of hope. Whatever it was has given them a very small chance of survival. But they're going to be invalids for the rest of their lives." Still, Christine Blanshard, medical director of the Salisbury District Hospital, says that Yulia has shown positive progression recently under treatment. "She has responded well to treatment but continues to receive expert clinical care 24 hours a day," Blanshard said in a statement.